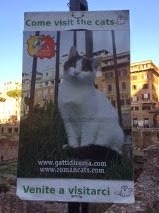 On my recent trip to Italy, I had the opportunity to visit Rome's famous cat sanctuary, Colonia Felina Torre Argentina, located amid ancient ruins in the heart of Rome. 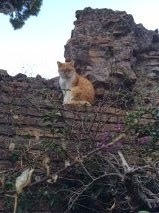 Upwards of two hundred and fifty cats, all spayed, neutered, and vaccinated wander among the remains of ancient temples. 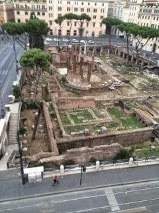 Several structures date back to 400-300 BC. 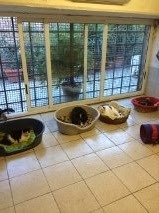 The cats are catered to by groups of international volunteers. The sanctuary also contains an underground shelter that houses many of the special needs felines. And, yes, many are adoptable! While we celebrate National Cat Day here in the US (and National Feral Cat Day on October 16th), it's heartwarming to know that TNR is being practiced throughout Europe and other spots around the globe. Wow, that sounds like a really neat sanctuary! I love that they have an area for special needs cats :) Very cool that you got to visit. Thank you for stopping by our blog and celebrating Delilah's birthday with us! You are most welcome, and thank you for posting a comment for Nat'l Feral Cat Day!